At the beginning of the 2015/2016 school year, two colleagues and I decided to try to de-emphasize grades and focus on learning and understanding through feedback and reflection which I wrote about last August. Our approach was somewhat rooted in standards-based grading (we called them Learning Targets) with lots of teacher and student feedback and required student reflections on their learning for each curriculum unit. But also with opportunities to meet with the teacher for what we called meaningful corrections where students showed new understanding of the Learning Targets they missed on their unit exams. At the beginning of the course the students received a guide (below) that detailed where their grade would come from. We decided that there were four core course standards that all students should be able to show progress and ultimately proficiency in during the semester: Summative Content, Formative Content, Scientific Practices, and Student Practices. A description of the four core course standards. In the online gradebook students received progress scores for their efforts on the Major Assignments (80% of their gradebook-reported progress: Unit Exams, Papers, and Unit Reflections) and the Minor Assignments (20% of their gradebook-reported progress: mostly Reading Quizzes and the Lab Notebook). Students were to understand that a “Complete” (100%) in the gradebook for an assignment meant that the student may not have been perfect on the assignment, but that the effort was good enough to move on. A “Partial” (80%) meant that the student had an opportunity to improve through written reflections and meaningful corrections. A “Rework” (50%) meant that the student must redo the work and/or meet with the teacher to show enough understanding to reach at least the level of Partial. A “Missing” came through as 0% (Bob Marzano would not support the 0%). Students (constantly) and parents (not nearly enough) were reminded that, given our gradebook system, the grade the online gradebook automatically calculates is not a real grade, but a progress grade. We put raw exam and quiz scores in the comment boxes for each gradebook item, along with teacher comments about the scores. If a student did meaningful corrections or reworked an assignment, this information also appeared in the comment box. The real grade would be determined at the end of the semester by the student through an evidence-based grade claim letter and by the teacher by looking at the same evidence. So was the course gradeless? It wasn’t gradeless. Not even close. The fact that we had to arrive at a grade for each student by the end of the semester was always looming. Students still could be seen calculating their percent scores after exams and announcing to friends, “I got a B,” or “I got an A!” It also became clear that both some students and their parents had trouble looking at the progress score and not seeing it as a course grade. This phenomenon is going to be a hard one to overcome. More on the grade claim later. Reading the student reflections for each unit was sometimes fascinating and enjoyable, sometimes frustrating, but always interesting and revealing. Some students were taking the reflecting seriously and some were not. Some students were really interacting with their knowledge and understanding and some were not. Perhaps some were just better at metacognition. However, it became clear early on that keeping up with reading and commenting on the students reflections for each unit was unsustainable. We used shared Google Docs for nearly all student writing (except exams), which simplified things a bit, but there was still too much to read. I had two sections (62 students) of this first-year biology course to keep up with plus two sections (63 students) of seniors where I was also using a version of this approach. One of my colleagues was juggling three sections of first-year students (90) but the other colleague was buried under five sections (150+ students). When I shared this burden with another colleague at my school, a Language Arts teacher and one of The Paper Graders, he had no sympathy (he is a Language Arts teacher!) and explained to me that student reflections do not need tons of teacher feedback, just an acknowledgement to the student that the reflection has been read. The most important thing for the student is that doing any kind of reflecting is better than nothing. Learning Target Tables. Out of this emphasis on reflections came two critical tools developed by my colleague, Kristy. One was a tool called the Learning Target Table. At the beginning of each unit students were provided a the list of the unit’s learning targets in tabular form with a space for students to show evidence to themselves before the exam that they understood the learning target. After the exam students had the opportunity to reflect on whether they were successful or if they struggled, and why. This was a student tool; we did not traditionally assign or collect these, but they could be used by students as grade claim evidence. Part of a blank Learning Target Table for our unit on Human Evolution. Summative Review of Learning Targets. The other reflection tool, called Summative Review of Learning Targets, students received right after getting their exam results. Here we showed the students how each exam question aligned with each learning target. We asked the students to again reflect on how they did. This is the document students were instructed to bring when they sat with us for meaningful corrections. And like the Learning Target Tables, students could use these as part of their grade claim evidence at the end of each semester. This tool was an extension of a backward design tool (channeling a bit of Understanding by Design from McTighe and Wiggins) we used as a teacher team to write the exams. Example of part of a student’s Summative Review of Learning Targets sheet for our unit on Biological Molecules. Many students used work from these tools in their written reflections for each unit. Feedback for students came in a few forms. As any teacher (I hope) would do, I constantly moved around the room during activities and chatted with individual students and groups of students. I looked at their lab notebooks and gave them kudos for great work and suggestions for improvement. I gave them bits of encouragement and cheers on their reflections (after realizing that I just couldn’t keep up with making long comments). I made comments on progress in the online grading program that both students and parents could see. But perhaps the most important feedback I gave was when students sat for meaningful corrections after unit exams. It was here that students, as mentioned above, brought their Summative Review of Learning Targets packets and initiated a conversation with the teacher on what they struggled with on the exam, why they struggled, and what they had learned in the process of working back through the learning targets. Many students arrived fully prepared and confident and came away empowered. However, some students showed up still shaky on some of the concepts. Both types of moments were opportunities for us to get to know each student’s abilities and help students with their progress. But not surprisingly, this most important type of teacher feedback, one-to-one teacher-student conversations, took the most amount of time. A year earlier, our school had put in place a block of time called Collaboration and Access Time (CAT). In the middle of our Block Days (Wed: Periods 1,3,5,7; Thurs: Periods 2,4,6,8) there is a 45-minute mini block where half of the teachers are available to students (Wed for Science) and half are meeting with colleagues to collaborate (Thurs for Science). On many days, usually the week after exams, I had a line of students wanting to sit for meaningful corrections and I would often work into the lunch period with them. Others would schedule to meet me during my planning periods. Students were also trying to meet with their other teachers. Even with CAT there was just not enough time to do some of the most meaningful work with students. This year we plan to try to find more class time to have these personal conversations with students. Regardless of how much we tried to de-emphasize grades during the year, we still had to post a letter grade (A,B,C,D,F; our District doesn’t use + or -) for each student. In an attempt to give students even more control over their final grades, at the end of each semester students had the opportunity to write a letter to the teacher where they claimed what course grade they thought they had earned. In their letters, students provided evidence for their claims from each of the core course standards. We provided students with the guide shown below for what it might look like in each of the standards categories to claim a particular grade. It isn’t clear whether or not such a detailed and structured guide for determining a final grade was necessary. Knowing the core course standards, would students have been able to make a reasonable claim without so much guidance? In your letter, please claim the level of excellence (A, B, C, D, F) at which you can justify you achieved during the Semester. Your evidence should include 1) How you did on the summative content (exams), 2) How you did on the science practices (lab work, writing, presenting, using peer feedback), and 3) How you did on your student practices (class participation, group work, sitting with me for corrections). You should also include as an appendix any Unit Reflections you wrote. Of course, seniors may be more sophisticated and mature than freshmen and sophomores and they may not need as much scaffolding on such an ominous assignment as making a grade claim. Indeed, even with little guidance most were able to write perfectly acceptable and reasonable letters for claiming their grades. At the end of 2nd Semester, all students were encouraged to fill out an anonymous survey to provide us with feedback on our approach to the course. Here are some of their more interesting responses (n = 200; N = 306). For the Lickert Scale statements, 1 = “completely disagree”; 5 = “completely agree”. Overall, it seems that the 65% (200/306) of students in the course who took the survey, the feedback was more positive than negative for most of the items on which we asked for feedback. In general, students felt less stressed than in other courses, they felt in control of their own success, and genuinely wanted to learn the material over getting the grade. Students also understood how to achieve the grade they desired and agreed that the grade they earned reflected their learning. Of the 200 students that took the survey, 157 sat for meaningful corrections. An overwhelming majority agreed that the experience improved their understanding of the material. However, an equally important and interesting result is that less than 25% of the students agreed that having to reflect on each curriculum unit helped them grow as successful students. So what do we do as we move forward? We continue to move in the direction of de-emphasizing grades. We continue to experiment with ways for students to feel more in control of their fates in the course. We leverage more time to interact one-to-one with students during class time. We make Unit Reflections optional but important evidence for claiming a final grade. We try to streamline the process of getting to the grade. We communicate more effectively and more often with students and parents about the difference between course progress and a final course grade. But perhaps the most critical thing we can do (I can do) is to carefully read your comments and suggestions about what we have attempted to do in this high school science course. So, if you have read this far, please take a moment to leave a meaningful and helpful comment. We cannot do this alone. Wow! 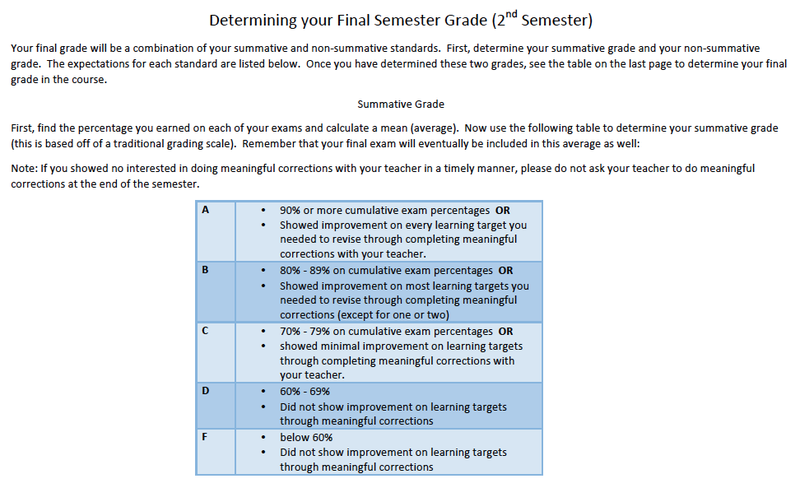 I liked a lot about the grade-less concept and will try to incorporate Learning Target Tables and Summative Review of Learning Targets this coming year, but I haven’t been successful in the past in keeping up with written reflections, so I’m hesitant about that idea. I would never make it as an ELA teacher! Another obstacle would be finding time to conference one on one with students; seems near impossible. Also, I doubt I would get administrative approval for such an endeavor. I applaud your idea and will continue to check in to see how you iron out the wrinkles. I wonder if 7th grade science students would benefit by reflecting on their success, and if it would help them grow academically? Thank you for your comment on my newest post about grades – I checked out the link you sent (this one) and realized I’d already read this one! I didn’t comment last time, but now I’ve got a few moments. I always feel that HS is so very different from MS, but one thing is the same – we are all looking for more TIME. You and I both have decided to give more time IN class for students to reflect. I believe this is integral in order to make our goals come through. Question for you – why do you have the “progress” grade at all? Can you input scores/marks in the grade book and not have it average them? If you could, it might make parents and students more aware of student strengths and struggles, but keep away from that final grade. Also, I’m wondering why you’re asking students to include their “activities” in their final grade. The bullet points you’re asking students to include in their grade are behaviors exhibited (or not). I’m trying to get away from putting a grade on behaviors. If they can show the skill, I feel that it doesn’t matter what got them there. Until my district goes full “standards-based,” I won’t worry too much about it, but I’m still trying to stick to the standards only. It’s oh so difficult to squash all of them into ONE grade! Ugh. Thanks for the post and the conversation – they both help me reflect and progress! “Given everything we’ve worked on in class this semester, tell me what you’ve earned and how you know this to be true…” I wish!! Maybe by the time they have a FEW teachers like you and your coworkers, they’ll be able to do this. I’ve seen I need a TON of scaffolding for many students in 7th, for sure. We’ll keep chugging on! I loved some of the things you used for students to monitor their learning. I like the idea of a written grade claim letter. I just do this orally in a sit down with them. 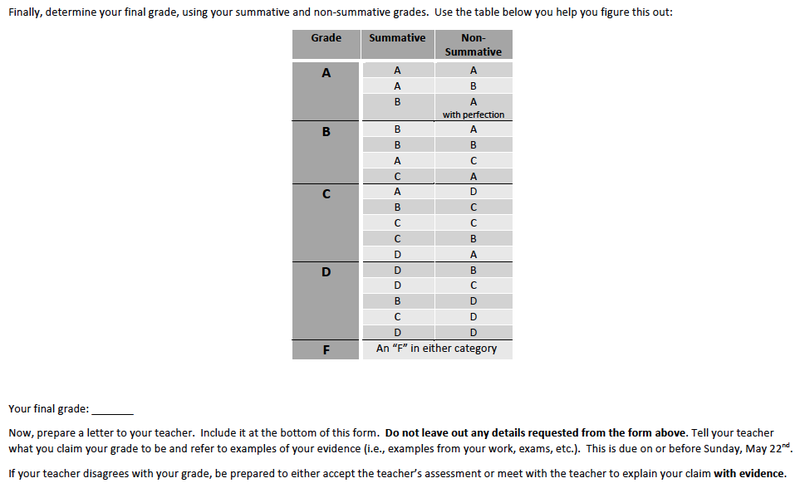 I also liked the two forms you used, learning target tables and summary review of learning targets, I think. These look like useful tools that I will try to incorporate into my classroom. The thought that kept going through my mind was that you simply traded one form of calculating the grade for another system. That could be a false impression, but the grade is still calculated through a series of steps, just different ones. That being said, I am certain your system of emphasis on learning, the meaningful corrections and such enable the students to focus more on learning the material. And in the end, that is the most important thing. I’m glad you have the courage and support to try these things with your students. I don’t know why it took me so long to find this, but I am glad I did. This is such a useful post for me as I move towards Grade-less this coming year. “Students (constantly) and parents (not nearly enough) were reminded that, given our gradebook system, the grade the online gradebook automatically calculates is not a real grade, but a progress grade.” I have toyed with this idea. I know I can do a progress grade and a real grade in our online gradebook, Infinte Campus, but your comments make me think that maybe I shouldn’t. I would like to use Infinite Campus as away to show progress without attaching a grade for it. Almost like a “Met standard” / “Standard not met but turned in” / “Missing” system but within IC. Have you found anything like that useful? You mentioned the unmanageability of keeping up with feedback in the course – I worry about that as well. Even without giving feedback I often found myself buried in grading and would get out of it through what I called a “power grade” which essentially became my fancy way of saying I was just checking for completion. Did you come to a point where you were able to give effective written feedback without becoming too overwhelmed? You mentioned the informal walk around the class feedback that you gave. Did you keep a record at all of what you noticed? I would like to have a written record of the feedback that I gave each student. I know that students have a tendency to continually ask for feedback without addressing the feedback that I gave. So I was hoping that I could log that feedback and make sure that they addressed it before resubmitting their work. 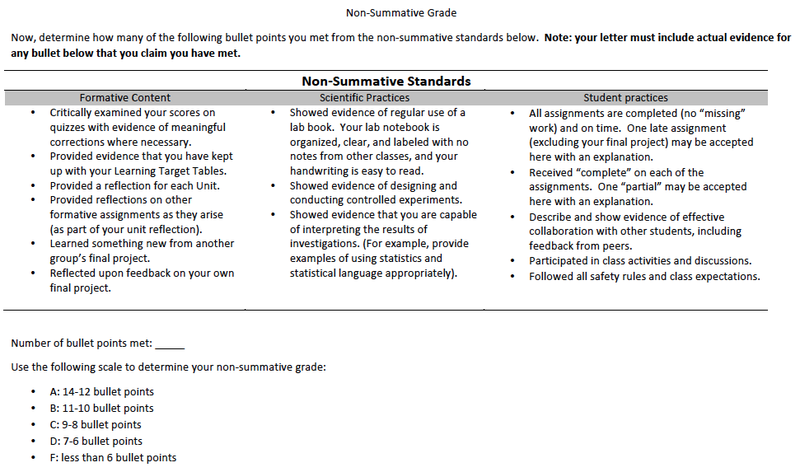 I love the two tables: The Learning Targets and Summative Review. It seems to me that the students would find these very useful in their learning. However, based on your end of course survey results it seems like that type of reflection was not valued by the students. That is really fascinating to me. Have you found out any new information regarding why that is the case? Thank you again for such a reflective post! Hi Mike: This comment slipped by me during a busy July. Thanks for the comments and questions! I’m now two years into going “gradeless” and am entering my third year. What has changed and I think is more interesting is that I have literally gone pointless. I blogged about it over the last two weeks and finally posted it today, just in time for Back to School Night this week when the parents come. You asked about detailed records. It turns out that I keep some records in Infinite Campus by way of the comments boxes, but the students are the ones keeping the detailed records of their learning and good work in their Biology Journals (shared Google Docs). When I see remarkable comments and reflections as I look through their work, I comment as well. This then becomes a record from which both the students and I can pull data. You mentioned the Learning Target Tables and Summative Review. Yes, students didn’t like these and so I stopped making them do that work. I still provide access to them because my colleagues still use them.